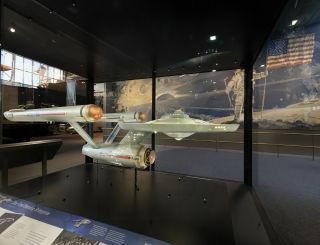 The USS Enterprise from the original "Star Trek" TV series is seen fully restored and on display at the Smithsonian's National Air and Space Museum in Washington, D.C.
"['Star Trek'] inspires to think about things in new ways, and to be really be engaged with the subject. 'Star Trek' fans are some of the most intelligent, positive viewers out there. They love science, they love creativity, the level of engagement is wonderful." Examples include Google Translate, which is mimicking the promise of the "universal translator" that rendered alien tongues into English. And the tractor beam, which snagged small spacecraft passing by the U.S.S. Enterprise, is becoming reality as well under research by David Grier, a physicist at New York University. "It's mindboggling that he took the idea of a tractor beam because of Star Trek, investigated the complex mathematical calculations, and thought, 'Huh it could be true,' " Trojan said. Grier is one of the founding members of NYU's Center for Soft Matter Research. Their goal is to understand how nature organizes itself, particularly in how molecules are arranged into three-dimensional configurations in the world around us. To probe this molecular world, they use a tool developed by Bell Laboratories physicist Art Ashkin in the 1970s, which uses the force exerted by light to trap and move things. Grier's group improved on this technology by studying James Clark Maxwell's equations on light in the 1870s. Based on that work, they structured the light in their device using holograms, to create a force field. Molecules usually interact randomly. What the technology allows researchers to do is move the molecules into a standardized "starting configuration", let the molecules go and then see where they go next. "So we made these beams that can pull. The real question is what's the range; if you can only reach a gnat's eyelash, then what good is that?" Grier said. So far, the range is less than a centimeter. With current technology, he estimates one day the pull could be as far as a kilometer (0.62 miles). While the objects they pull are small, this could be useful for applications such as studying dust coming off a comet. Instead of forcing a spacecraft to go in close to the dangerous environment, it could stand somewhat back and deploy the tractor beam to pull the dust in, Grier said. Set phasers to ... reality? Where did all that superscience tech come from? On "Star Trek," phasers were used as gun-like weapons by crew members in "Star Trek." In the show, these laser weapons can also be used to destroy nearby objects if the crew members are trapped in a particular area. While phasers today aren't quite that small, one concept being tested for the battlefield today is somewhat portable: it can fit on a small utility truck. The documentary shows a Lockheed Martin system called ATHENA (Advanced Test High Energy Asset) targeting a missile in a classified target range. Over time, the laser locks on to the missile, heats it up and eventually breaks it apart. The system has also been used on small boats and unmanned aerial vehicles (UAVs). "The invention of the laser left the imagination to wonder if there could be utility with a laser weapon for defensive purposes. Lockheed Martin has tried to apply the laser for multiple missions, and the one ... in that video was a good example," said Tyler Griffin, the director of laser and sensor systems for Lockheed's rotary and mission systems business. While ATHENA is an internal Lockheed project created by offices in Sunnyvale, Calif. and Bothell, Wash., Lockheed is also testing a laser system for the U.S. Army that will be more powerful than ATHENA. The U.S. Army system is in lab testing this year and will be sent to the army in calendar year 2017. In Trek lore, tricorders were medical devices that could be used in the field to diagnose certain medical conditions. The idea remains appealing today for those patients who live in isolated environments, such as the Arctic, and of course for astronauts who are on the International Space Station. Sonny Kohli is part of one of a few finalist teams in the Qualcomm Tricorder X Prize competition, which should be decided early next year. His Canadian company, Cloud DX, is developing two versions of the tricorder – one to fit the requirements of the competition, and one that is being tested right now in Haiti. "You almost forget you wear it," Kohli said. He wears the five-pound device regularly at the office and while working out. It monitors vital signs such as breathing and temperature, and can also diagnose some diseases such as urinary tract infections, pneumonia, anemia and HIV. Kohli is a critical care and internal medicine doctor who has an ongoing interest in space medicine. In 2009, he made it to the "final 15" for the Canadian astronaut recruitment campaign. While his swimming skills disqualified him for space, Kohli pursued his interest by taking summer courses in Barcelona for the International Space University. It was at ISU that Kohli met Peter Diamandis, who not only founded the X Prize but also co-founded the university. Diamandis invited the students to pitch him any interesting ideas for future competitions. Kohli had spent time in Haiti in October 2010, shortly after an earthquake devastated the country, and realized an instant-diagnosis kit could be helpful in areas wracked by natural disasters. Kohli said he flew to Santa Monica shortly afterwards to pitch Diamandis' team on the tricorder idea, but was initially turned down. However, an X Prize was eventually established and out of an initial field of about 330, Kohli's team is the last Canadian one standing among seven finalists, who also come from the United States, Taiwan and India. Eventually, Kohli hopes to use a tricorder to monitor his aging parents across the country in Calgary, Alberta. He also hopes that people will be able to wear it as they go about their everyday lives, whether they're in a theater or at their day job.